Days of Whine and Rosé: Life In An Autism Household : How THIS mom reacted to an ignorant stranger many years ago, and what will come of it!! How THIS mom reacted to an ignorant stranger many years ago, and what will come of it!! Many, many years ago now, I was a young, very poor, mom, raising 3 boys on my own, two of whom are ASD. DAILY we would endure attacks, mainly aimed at me, from the uniformed, the uneducated. 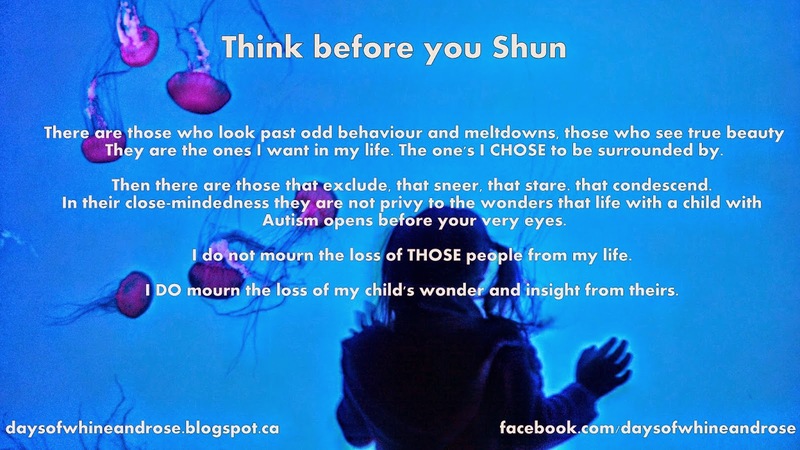 Those were the days when even most doctors hadn't heard the word AUTISM, when venerable institutions like The Toronto Hospital for Sick Children still had doctors telling moms like me, well not LIKE me, actually telling ME, that autism was caused by mothers, ie ME, not loving their children. There were no facebook groups. Heck, there was no GOOGLE. So you figured things out, on your own. Figuratively and literally, because, back then, with the stress of raising a child with special needs, but in particular at the time because of lack of awareness and resources, particularly if you were in an autism household, the odds were 9 out of 10 times you were a mom going it alone. completely alone. dad disappeared. No every other weekend off. My middle son was quite challenging at the time. Unfortunately there were more resources for his brothers as `siblings` dealing with life in an autism household than there were for him. His sensory challenges were off the charts. He could run anywhere, and did (he was a bolter) but he could not walk more than a step or two. When you run, you are on your toes, when you walk, your whole sole touches the pavement and for a much greater length of time. My son was in excruciating pain anytime he had to keep his foot flat on any surface, so naturally, after one or two steps, his body would crumble, he'd dissolve down to the ground. While he was small enough to fit in a stroller, there was no issue. but what happens to a 12 year old, who can run for miles, but cannot walk. who has no sense of personal safety, no awareness of danger, in a society that sees his challenges as a simple result of bad mothering? The result is no help. So I saved my pennies, kept my eyes open and was finally able to purchase a wheelchair at a second hand shop. We didn't have a car, so if we went anywhere I had to carry my 12 year old on my back, while pushing my 4 year old in a stroller or when he was smaller. carrying him on my front in a baby bjorn, and keeping my Aspie eldest son calm. A wheelchair, with a seat belt, brought some ease physically, and allowed me some breathing room. My son was safe. And he FELT safe. Having boys, well, sometimes you need to just tire them out, SO one day, after a long rough week at work, I took them to the local public pool, While we were in the pool, someone stole the wheelchair I had saved my pennies for. the wheelchair i could not replace, the wheelchair that allowed all my family to get out together safely. That wheelchair meant the difference between us getting out as a family and me having to hire someone to help while I took Eric out and hired another someone to watch the other boys (at a time when we were accessing food banks at least once per month), well, with that, the theft of the chair was a hard blow. But I didn't show the boys. We'd had fun in the pool, they were tired, we could go home and all fall asleep peacefully. Thankfully, my boys remember the day differently. As we trudged up the street, Eric on my back, banging his head against the back of mine (he was thoroughly confused! Where was his chair?) me pushing my toddler in a stroller and still managing to have my 15 year old hold my arm, a man stopped dead in front of us. I nearly ran him over with the stroller. THAT kid has autism and if you had a therapy to help him progress you'd win the Nobel prize, so move out of our way! He scoffed and walked off. My eldest and youngest remember this day fondly, talk about mommy telling off the jerk. We've come a long way since that day, as a family and as a society. But tomorrow, for the first time since then, I'm taking Eric and now my granddaughter as well, back to that pool. Its something I feel I have to do, for Eric who has been shut in so much lately, as much as for myself. I know that Eric and my granddaughter will love it. we're in the midst of a heatwave and we can all use the dip. But I'm just not sure how I can cope.